Even more ninja action on VC! Things are a bit disappointing on the download front for Europe this week - only the Virtual Console release can really be recommended. What's most interesting about this update is that we've finally gotten a WiiWare game North America has had for over a year - if only it was any good! 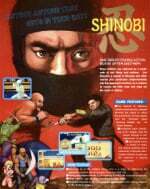 It's taken a while, but the original Shinobi is finally available on Virtual Console. Thankfully, Sega skipped the Master System port and has immediately given us the superior original arcade game. 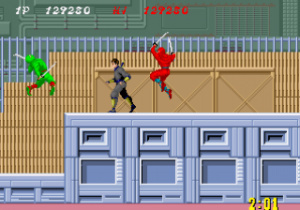 As with all other games in the series, you play as the titular Shinobi, who must traverse a multitude of sidescrolling stages, using his various ninja tricks to stop an evil gang. It's not as good a game as Revenge and Return, but if you'd like to see how Sega's classic ninja series got started, you can now. The game costs 800 Wii Points, and we'll review it soon. One of this week's WiiWare releases is extremely odd, to say the least. Protöthea was released in North America in June - last year. It's been rated for the longest time, and to be honest we thought it wouldn't see release with all the other upcoming WiiWare games. Needless to say, it's not very good - basically just a generic shoot 'em up with some faux 3D graphics. And with so many fantastic shmups available on VC already, it's hard to recommend, especially at the price of 1000 Wii Points. The other WiiWare release isn't much better though - PictureBook Games: A Pop-Up Adventure is Nintendo's attempt at creating another good board game after the Mario Party series, in this case one which heavily relies on cards rather than dice. Long story short? They didn't succeed. The game costs 800 Wii Points. Strangely enough, today's new DSiWare titles were the only ones announced by Nintendo for release. A Little Bit of... Dr. Kawashima's Brain Training: Arts Edition features yet more brain exercises from the Brain Training series, this time consisting of a bunch of arty games. Like the previous two titles, it's actually not that bad, so if you're looking for a compact Brain Training fix, for 800 DSi Points, this is a good pick. Combat of Giants: Dragons - Bronze Edition is a small version of Ubisoft's retail DS title Combat of Giants: Dragons, which was released earlier this month. You can play as a variety of dragons as you fly around and battle other dragons. There's not many reviews for the full game around, but those that exist are generally positive - of course, we can only hope this version is decent as well. It costs 800 DSi Points, and we'll have a review available in a few days. No good surprises this week! Next week's update is on the day before Halloween, so we think the release of a certain Virtual Console game is quite likely! Lucky? What makes us lucky about this release except for Shinobi? @KeeperBvK: I just meant Shinobi, not the other games. No big surprises?! I'd call Protöthea a huge surprise. Not perhaps the kind of surprise I looked forward to but as far as it being surprising it's a huge shocker none the less and one that's unlikely to be topped any time soon. Yeah. Such an old game in America finally getting released here is quite amusing. But nothing for me this week. Here's hoping Zombies and Castlevania Rebirth get released next week. But if its Ghoul Patrol, I'll pass. AAAAAAAWW!!!! Europe got Shinobi first. Shinobi is interesting. I may get it. On the Wiiware front, I wish they'd play catch up with Rock'n'Roll Climber... c'mon!! @Shiryu - You're really not missing much. Gyrostarr is easily one of the most boring games I've ever played. I think Europe will getting all of Sega's arcade games before America. Whats the certain vc game europe is getting next week? zombies ate my neighbors. likely but not confirmed. Shinobi, just played though the first few levels and remembered why I think video games are great! Dang Dazz, you snatchin' up all the VC reviews. Nothing for me, unfortunately, even Shinobo isn't my thing. Oh well, better luck next time. @taffy "why didn't they release LIT instead? Oh well, i'll save my points for something else" Read this and please stop mentioning Lit. Its only a matter of time before Sega waste a week with the SMS Shinobi. also, wasn´t bomberman blitz supossed to come out on this update? @vakama94 - Absolutely, incredibly, shockingly, mind-numbing. Quite the boring game. I have a lot of good memories of SMS Shinobi. I would like to see it on VC too, for nostalgic reasons. Pretty poor update except for Shinobi. I'm guessing the release list Nintendo put out is more or less abandonned now.....? And shouldn't we be due another Hanabi Festival soon!? However, do remember that wiiloveit likes B-Plus' games too... So I don't know, his judgment might be kinda questionable... Not saying Gyrostarr is good cause I don't know. It's just that... Well, you should get a second opinion. @taffy "my point was in why didn't they release something more worthwile" because the garbage has to be released sometime anyway. Woohoo! Shinobi! Here's to hoping for a quick NA release. Sninobi is cool. Though, not quite sure which one is my favorite in the series. Shame it wasn't Gyrostarr instead of Protothea. It's one of four NA-only WiiWare releases I have on my new "Brazilian" Wii and I quite enjoy it. Oh great, another system update... At least there's nothing important out now. Oh, Protöthea is really a surprise. Not a good one, though. The german Nintendo website still says that the release date for Cave Story is october 2009. So, next week then? Along with LIT? Or will they "surprise" us again and release Big Kahuna Party and Boingz instead? Without the fail WiiWare releases, this is a pretty good update. I have BT Arts on my insta-download list so fair dues. I discounted Gyrostarr before? Is it really that good? I'm undecided from the revw on this site. I'm not interested in Protothea. I played a downloadable demo of combat of the giants: dragons from the Nintendo channel. I wasn't impressed at all. The stylus controls were imprecise. I wonder if the actual dsiware game is an improvement? We shall see eh. Shinobi looks very good, i hope in America cost 600 instead 800 pts. I think its the recommendable. Darnit, still nothing I can buy with the 200 DSi Points I earned from filling surveys. Oh well, it's not like the points will go anywhere soon. Yeah...I always heard good things about the Master System port. Hold, I think I have it, actually. Edit: no, I had the Game Gear version(which is a completely different game), and it sucked badly.